In the last days of last year, the municipality of Bozhurishte, near the capital Sofia, which is run by the ruling Citizens for European Development of Bulgaria (GERB), has sold 80 decares of land suitable for industrial construction literally for pocket change – BGN 2 to 3 per square meter. Actual market prices range between BGN 30 and BGN 40 leva per square meter. The beneficiaries are companies associated with GP Group, as well as a lady investigator from the National Investigative Services (NIS). The red flag about the scandalous low price was first raised by the Chairman of the Bozhurishte Municipal Council, Georgi Dimitrov, in an interview with the website FrogNews. He claims that he has alerted the Commission for Combating Corruption and the withdrawal of illegally acquired property (KPKONPI) (sic) and the prosecution about the case. 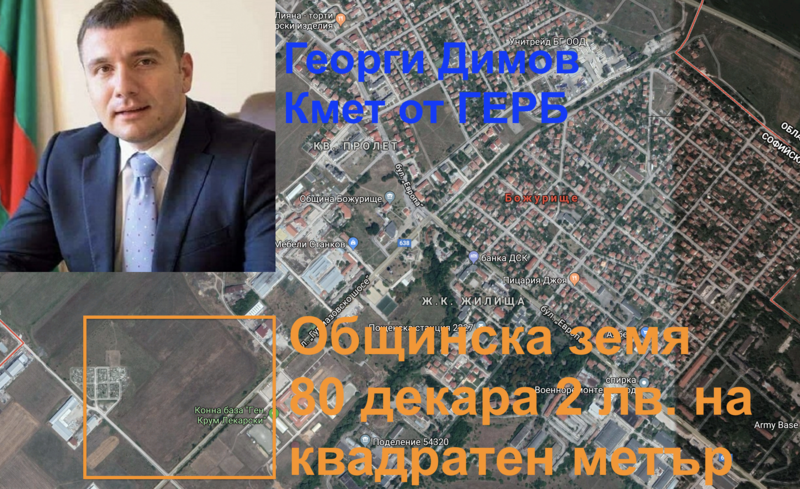 Mayor Georgi Dimov fired back with arguments that such was the decision of the Municipal Council, that the land was farmland and the price was fair and corresponding to the market one. The Bozhurishte Municipality has ordered last year a market appraisal to the company N.D. Expert Ltd of four plots with a total area of ​​80 decares, located in one of the most attractive areas for clean industry around Sofia. The experts have appraised the plots at BGN 1.68 per square, a market price that does not exist anywhere in the area. On October 29, 2018, the Municipal Council voted to sell the plots at an auction with a starting price aligned with the appraisal. “Land on the main street with sewerage and plumbing, a gas pipeline, this price is not realistic,” municipal councilor Asparuh Asparuhov said during the debates. There were also other voices, pointing out that the municipality is in good financial condition and there is no need to sell these terrains. But, in the end, the municipal councilors from GERB prevailed in the vote and it was decided that the terrains would be auctioned by secret bidding. Two of the winning bidders – Jurist Group Ltd and Infinity Properties Ltd are linked to the scandalous GP Group, Bivol found. Infinity Properties was registered at the address of the GP Group headquarters at 59А “Cherni Vruh” boulevard in Sofia by Krassimir Bogdanov Krastev. The registration is dated December 4, 2018, just a few days before the land auction. The company bought 18,070 square meters for BGN 39,900 or BGN 2.2 per square meter. The sales contracts were concluded on December 27, 2018. The third winning bidder company is Magor 01 from the central city of Veliko Tarnovo, which is engaged mainly in logging. It has paid BGN 37,800 for 18,000 square meters or BGN 2.1 per square meter. The fourth terrain went to the former Head of the Inspectorate of the NIS, Vanya Atanassova Doycheva, for the price of BGN 52,500 for 20,567 square meters or BGN 2.55 per square meter. She was among the magistrates holding senior posts in the NIS, who were dismissed by Prosecutor General Sotir Tsatsarov in early 2014, after he found that the national investigation was “in coma vigil”. We will learn who will actually benefit and profit from these lucrative lands once they are resold. This will surely happen someday, as none of the above-mentioned entities have the capacity to use them as intended i.e. as industrial sites. The Mayor’s argument that the land was farmland and the price was fair and a market one because it is not in regulation is not convincing. The real estate prices in the area can be easily verified by checking property listing sites. The search for farmland near locations in regulation and infrastructure around Bozhurishte in a specialized site shows an average price of EUR 13,882 per decare. Thus, the Bozhurishte Municipality could sell the lucrative 80 decares for over BGN 2 million. Instead, it sold them at a price twenty times lower than the market price. But not to some random people. In addition, the Municipality could gain even more if it turns the terrains into lands in regulation. The change of status would cost about BGN 500,000, but then the price jumps by BGN 70-80 per square meter. In other words, the Municipality has lost nearly BGN 6 million from this strange deal. Following the European funds scandal #GPGate, revealed by Bivol, which involves the until-recently darling of the government – GP Group, associated with the boss of Lukoil Bulgaria Valentin Zlatev and the alleged drug trafficker and underground boss Hristoforos “Taki” Amanatidis, Prime Minister Boyko Borisov ordered GP to be removed from all public procurement contracts. The Prosecutor’s Office also intervened and charged two of the GP bosses with money laundering in particularly large scale. EUR 14 million were seized. At the same time, the Prosecutor’s Office has not yet questioned any of the owners of the consultancy companies which had carried out a bribery and manipulation scheme for BGN hundreds of millions. Petar Elen Petrov, Tatyana Delibasheva (Tanya) and Lilyana Zorteva (Lily) continue to work undisturbed in the same field to finish old and to apply for new public contracts through their companies. There is also no movement in the investigation into the destroyed documents, removed from the building on 59A “Cherni Vruh” boulevard in a company car of a company owned by Peter Elen Petrov and Tatyana Delibasheva, and burned in a field near the western village of Egulnica. There is no law enforcement activity against Theodora Treneva (Tedi), who, according to the documents published by Bivol, deals with the laundering of the diverted European funds. The two Russian billionaires Roland Isaev and Paata Gamgoneishvili, who patronize the scheme,are not in the crosshairs of the Prosecutor’s Office either. It also turned out that they had received Bulgarian citizenship, probably on merit or as investors. The scheme with the municipal land in Bozhurishte, as well as other deals and public contracts that Bivol follows closely, prove that Borisov’s order to remove GP Group from the “government feeder” is a smoke screen for diverting attention. Bivol is preparing another publication that will reveal that GP Group continues to enjoy the loving care of GERB’s structures. On January 28, at the end of the business day and with a 30-minute interval, Bivol’s editorial office received a rebuttal from GP Group and a right of reply from Krassimir Krastev from Infinity Properties. Both documents state the same thing – that the companies have nothing to do with each other, and the address of Infinity on 59A “Cherni Vruh” boulevard is not the same as the one of GP Group, as it is located in a neighboring office building that has the same address. “I insist that the article denigrating my name and my company be corrected, and I expect my right of reply to be published without any editorial intervention. If not, I will be forced to defend my rights in all legal ways,” Krastev writes. It is not clear which exact words denigrate his name and his company, but he hardly means only the address. An interesting fact is that the GP Group rebuttal contains the metadata of attorney Raycho Kotov as author. In its investigation #GPGate, Bivol established that Kotov had appeared as an independent expert in public procurement committees, where the public orders had been won by consultancy companies in the GP Group orbit. At the same time, he had been an employee of GP Group. The name “Raycho” also appears in lists of bribes and commissions for officials and businesses that are yet to be addressed by the prosecution.